AirLink RV50X Industrial LTE Gateway. Now with 1 yr Airlink service included! 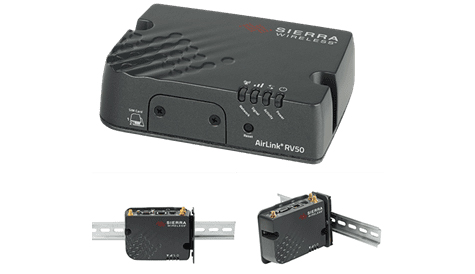 The AirLink RV50X is the industry�s lowest power and most rugged LTE gateway. Simple to install and easy to manage, this industrial-grade gateway is designed to connect critical assets and infrastructure. Ideal for energy, utilities and smartcity applications, the RV50X provides real-time remote connectivity for SCADA, distribution management systems and metering. With the lowest power consumption available on the market, the RV50X dramatically reduces infrastructure costs when running on battery or solar power. The RV50X variant supports an extensive range of LTE bands worldwide, and its LTE-Advanced capabilities deliver up to 300 Mbps downlink speeds. For deployments in areas with limited LTE coverage, the RV50X provides fallback to 2G and 3G networks. Furthermore, the RV50X provides programmability to enable edge computing applications, using the ALEOS Application Framework (AAF). The RV50X is designed to withstand harsh industrial conditions, and is capable of surviving 5 V brownouts and spikes from -600 VDC to 200 VDC. Certified as Class I Div 2, it is ideal for hazardous environments. The die cast aluminum housing is sealed to meet IP64 for resistance to dust and water ingress. The RV50X is tested to meet and exceed the MIL-STD-810G specification for shock, vibration, temperature and humidity. The built-in power supply protection make it suitable for harsh electrical environments such as compressors, generators, and excavators. The RV50X offers best-in-class power consumption combined with LTE performance, and is optimized for battery and solar applications. It is the industry�s only LTE gateway with 2G power consumption, operating at 900 mW in idle mode. For 2G and 3G deployments migrating to LTE, the RV50X will work with existing power infrastructure, eliminating the need to invest in replacement solar panels or batteries. Standby Mode provides additional protection for batteries by dropping power consumption to 53 mW, and can be triggered by timers, low voltage detection or I/O. The RV50X automatically configures the radio based on the SIM, which provides versatility and simplicity when changing operator networks. Ideal for global deployments, the RV50X provides worldwide LTE coverage with just two product variants; one for North America and EMEA, and one for Asia-Pacific. Network Management solutions for the RV50X allow over-the-air registration, configuration and software updates, and can be deployed either as a cloudbased service, or as a licensed software platform in the enterprise data center. Both options provide a centralized and remote view of an entire fleet and enable simplified management, control and monitoring of connected RV50s and critical infrastructure. AirLink Management Service (ALMS) is a secure, centralized cloud-based service that remotely monitors and manages signal strength, network technology and location. ALMS provides dashboards with up-to-date views of an entire deployment, and custom alerts to monitor and report critical events, to increase efficiency and prevent downtime. AirLink Mobility Manager (AMM) is a licensed, unified software platform which can be deployed in the enterprise data center, and provides a consolidated network view of an entire fleet, using a virtual dashboard to monitor, report, manage, and troubleshoot all mobile resources as required. The RV50X is designed to install directly into existing infrastructure. Offering both serial and Ethernet connectivity, it can be used to connect devices like PLCs and RTUs, and transmit a wide variety of protocols like Modbus/DNP3 with ease. RV50X can also be integrated directly into existing management systems via SNMP. The RV50X provides an application framework which allows customers to apply intelligence at the edge of the network. The RV50X offers a dual core processor which enhances the performance of edge applications. The RV50X supports secure communications to multiple back-end systems by providing up to five concurrent VPN sessions. Remote authentication management allows enterprise-grade systems to manage access to devices in the field. Port filtering and trusted IP protect the devices connected to RV50s from unwanted access. Secure signing and authentication of software images offers end-to-end protection of the software upgrade process, protecting the RV50X against unwanted malware.